Whether you plan to use ppvote, our PowerPoint based Audience Response software, or develop your own custom voting application, our knowledgeable team is always happy to provide you with any information and guidance that you need. You can read more about our manufacturing process here. We can supply you with as many handhold voting devices you need. 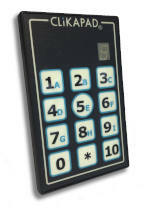 The CP37 keypad is CLiKAPAD’s multiple choice voting unit, offering excellent functionality at a great price point. It is credit card sized and is capable of operation with multiple base units for multiple choice voting in the range of 0 to 10. The CP37 has an alpa-numeric 7 segment LED display to confirm to the user which button was pressed. It can operate on a range of channels and has built in Detect-Mode.